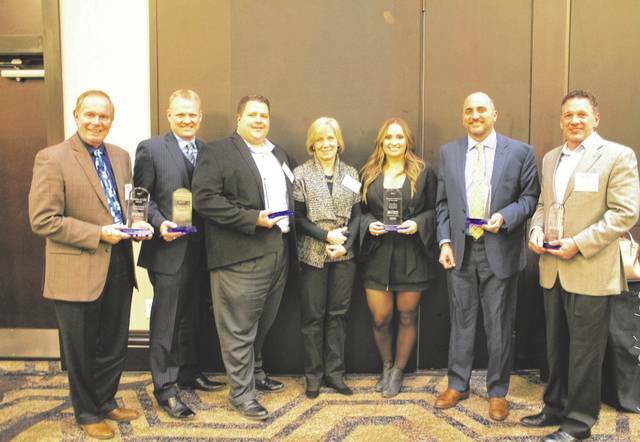 Pictured are the recipients of the Delaware Area Chamber of Commerce’s annual business and community awards, which were handed out Monday at the Hilton Columbus/Polaris during the chamber’s annual dinner. The winners are, left to right, Paul Huttlin, Recreation Unlimited, Quality of Life Award; Chad Hoffman, Richwood Bank, Innovation in Business Award; Aric Arnett, Ohio Living Sarah Moore, Outstanding Chamber Member of the Year Award; Susan Wells, Citizen of the Year; Stephanie Clarey, Two Men and a Truck Columbus, Corporate Citizen of the Year; Steve Thieken, Burgess & Niple, Large Business of the Year; John Hetterscheidt, Hetter Heating & Cooling, Small Business of the Year. It’s no secret the City of Delaware has become a coveted place to live, especially for young families. As for the reasons why people are flocking to the city, one has to look no further than the people who make up the community. People like Susan Wells. A longtime supporter of Delaware City Schools, Wells was named the Delaware Area Chamber of Commerce’s Citizen of the Year during its annual dinner and awards ceremony held Monday at the Hilton Columbus/Polaris. 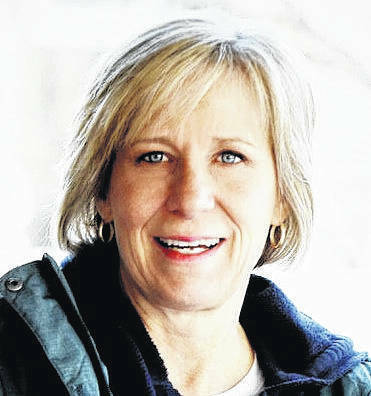 Hostutler added that not only does Wells help organize events for students and teachers, but her involvement on levy and bond issue committees over the years has helped the district garner voter support while other area districts have seen similar levies voted down. Officials at DCS couldn’t agree more. “Susan is one of those people who has endless energy,” said Director of Communications Jennifer Ruhe. “Not only is she active at her children’s three schools (Smith, Dempsey and Hayes), she has spent many hours volunteering at the district level. Instead of tooting her own horn, Wells took a moment to thank her husband, Tim, for supporting her in everything she does, and DCS Superintendent Paul Craft for his support and giving her the chance to give back to the school district. “Years ago, (Craft) found me at an event, and he started talking about a levy. It all started there,” Wells recalled. She also thanked those who have made it their mission in life to help the city’s youth. Wells added volunteering is simply her way of lending a hand to the community she feels blessed to call home. “I’m just so honored to give back to a community that’s given so much to me and my family,” she said. The fact Wells used her time at the podium to thank the school district for its contributions toward making the city a desirable place to live and raise a family didn’t come as a surprise to those who have seen her devote so much of her time to the betterment of DCS.